Stream the Amandalynn Artist Channel. View her works also on the Graphic Styles channel. Amandalynn is a San Francisco based Muralist, Fine Artist, Conservator, and Art Director. Inspired by the female form and spirit, Amandalynn depicts strong, seductive women and illustrates their strength through line work and decorative patterning. Her works can be found in Galleries and Streets all over the world. She began developing her distinct Street Art style mural work in 2001, painting alongside the infamous graffiti collective, The Seventh Letter. Amandalynn is very passionate about her outdoor mural work and still enjoys collaborating with a variety of different artists, as well as creating large solo works. In recent years she has been Art Directing a large music and arts festival called KAABOO. Amandalynn has always enjoyed curating and assisting other artists in their work, makingArt Direction a natural path for her. Fine Art also plays a key role in Amandalynn's life, as she continues to develop her career as a Gallery artist. 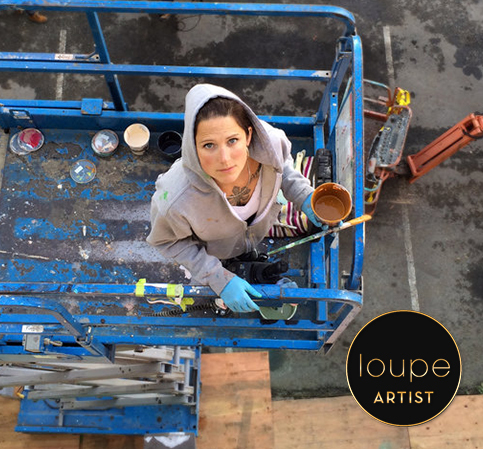 She has a Bachelor's of Fine Art from the San Francisco Academy of Art, and has worked alongside professional conservators within her career. Amandalynn believes that sharing the creative process with others is the key to living an inspired life.